When I started to run again, I assumed that running was one of the cheapest sport there is. All you needed was a shirt, a pair of shorts and a pair of rubber shoes and you’re ready to go. Boy, was I wrong! I learned that the more I get addicted to running, the more I needed gear to improve my PRs. Still, running is cheaper than my old sport (golf) and less time consuming. I ran because I wanted to lose weight. I had to engage in another exercise besides Hip Hop Abs and Yoga. I had a pair of rubber shoes which I bought from Singapore during one of my trip as the family and I did ALOT of walking and I was forced to buy a pair. Hubby didn’t like Nikes as he felt that these were overrated. So he bought me a pair of Adidas Eva, Adidas being his favorite brand. This was the pair I used when I started to run. Fast forward 4 months, now a certified running addict, I have 4 pairs of running shoes. My old Adidas Eva which I still use for XT; a pair of Adizero Ace, which I bought to avail of the recent Trade-in promo; a pair of Nike Air Alaris 2+, an impulse buy as it was on sale and I really wanted to try out the Nike+ iPod sensor (I didn’t know then that you could use non-Nike shoes with the sensor, check out my previous blog Adizero, Nike+ and Google Knowing All) and pair of Mizuno Wave Frontier 2, which I bought from the very helpful shop…SecondWind). I broke these shoes during an evening run in Ultra. These were the lightest shoes I’ve ever worn. It worked well for me during slow runs, speed work and even the drills. Since it has a mesh upper, I felt that these shoes were well-ventilated. 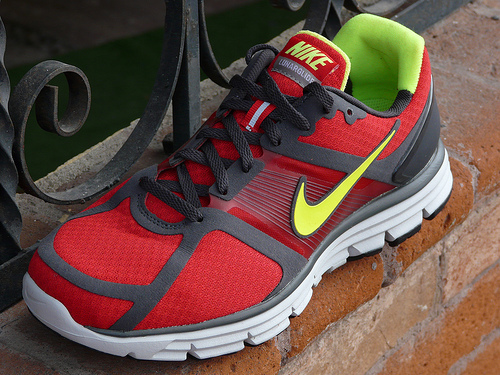 I also noticed that I improved my time running with these shoes compared to my heavier Nike Air Alaris 2+. However, I have noticed that the cushioning is just right for running 5k-8k. Any distance beyond 8k would require more cushioning. Then again, I am a bit on the heavy side. I also experienced blistering on my left arch while running with these shoes during my last race (Globe Run for Home). My hubby blamed it on the socks I wore that day. Lightweight – These are the lightest shoes I have every tried on. A bit narrow for wide feet like mine. I believe this is the reason why I got blisters on my left foot arch. The upper mesh was rubbing on to my arch. Cushioning might not be enough for some as the rubber sole was a bit too thin as to not compromise the lightweight feature, I assume. I rate these shoes 8/10. I would wear them again, maybe with thicker socks. An impulse buy as I said, I bought this pair due to two things: Its Nike+ ready capability and the fact that it was on sale that day. I wore these shoes more during training and only once during a race. I loved the fact that it was Nike+ ready. My world was opened to the world of responsive racing and AI coaching using Nike + iPod sensors. Heavier than the Adizero, these shoes gave me the cushioning that I felt my knees require. The upper and body was wide enough to accommodate my feet and were very comfortable to wear. Rating: 7.5/10. It might not be the correct pair for me but I was still comfortable wearing these nonetheless. I then asked him to recommend a good pair of shoes with ample cushioning for neutral runners. He gave me 3 options. His best reco was a pair of Asics Gel Nimbus 10. I loved the fit and the bounce but he didn’t have my size and it was really expensive at P6,750. Next was Mizuno Wave Precision 9. The colors were psychedelic. Hector recommended I get the orange one. I was a bit hesitant but seriously considered it. However, upon trying it on, I felt that the for wasn’t for me. We tried a larger size but it was too big. He then recommended 2 more shoes. The Mizuno Wave Frontier 2 and the Asics Gel Kanbarra 3. I first tried on the Mizunos. These shoes felt great! Although they were a bit heavy, the comfort you would feel would be worth it. It felt like I had my feet enveloped in pillows. Whether that’s a good comparison or not, I felt that I had finally found my training shoes 🙂 Just to make sure, I tried on the Asics Kanbarra. It looked and felt durable but it was just too hard compared to the Frontiers. I tried training and racing with these shoes. Training was great. Racing was alright but if you are aiming to beat your PR, running on 5k-10k then a lighter shoes would be more suited. For cushioning, these shoes are the best I’ve tried so far. I am a midfoot runner but sometimes would experiment running with heel strikes. I injured myself doing this with my Nike and my Adizeros. It doesn’t make a difference with Mizunos. Now to get me one of those Nike LunarGlide+ and Asics Gel Nimbus 10. Yes, running is not becoming an expensive sport. I chose my favorite route, BHS to Mckinley Hills and back, to test Max (name a gave my LunarGlide+). I promised hubby that I would run with him as long as we go to McKinley Hills…well, at least the 1st part of the route 😉 We initially decided to run at a very relaxed pace of 7:30. After 1.2k of warm up, we headed to McKinley Hills. I guess hubby felt motivated to run faster. I was surprised to see that he started to run with a pace of 6:30, 6:00 to 5:30 until we reached the intersection of McKinley. It was exhilarating to run side-by-side with him at that pace. Max was doing great! He was very light and yet, he gave me enough cushioning. I also did not experience any shin splints which was great! Great performance! Max was great during my run downhill towards McKinley Hills, uphill back towards BHS! Still no shin splints. By this time, I had decided to push myself to a faster pace to further test Max. I was maintaining a 6:00 to 6:15 pace from Essensa to further down McKinley intersection and back to BHS. I cannot find anything to complain about these LunarGlides. Such awesome pair of shoes! I got my 2nd pair already in the classic white and orange.